Set out for an eight-mile drive that is unlike any other driving experience in the Eastern United States on the legendary Mt. Washington Auto Road. Take a fantastic journey to the summit of the Northeast's highest peak and ride through breathtaking backdrops in an ever-changing show of light, clouds, climate zones, and colors. Take your own car and experience the timeless and dramatic beauty of New Hampshire's Presidential Range, or be a passenger in a two or three-hour guided tour. Hike up and take a one-way trip back down, as this ride offers a once-in-a-lifetime thrill in any season. Hours vary per day, but typically are 8 am to 5 pm for Drive Yourself. Please check their site for exact times. 3-hour Summer Tours run at 10 am and 2 pm on Wednesday, Friday, and Sunday. How long is the drive to the top? What do the tours offer? There are two types of guided tours available for Mt. Washington Auto Road, a two-hour, or a three-hour. 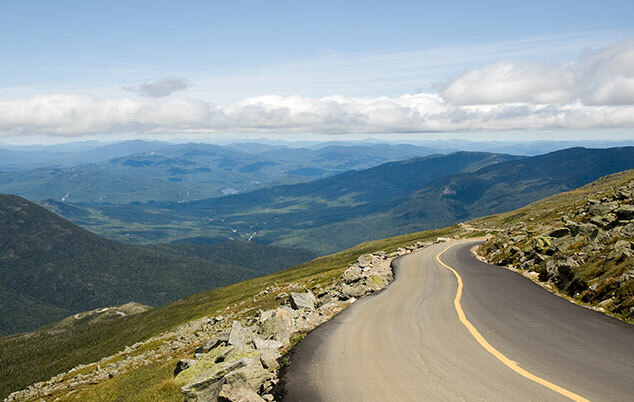 Both offer a unique opportunity to learn all about the history of Mount Washington and the Auto Road itself, as well as the nature it surrounds. Tours are led by experienced drivers who know the road backward and forwards. Listen to their tales, stories, anecdotes, legends, and insight into the highest peak in the northeast. Once on the summit, guests are free to explore the Sherman Adams Visitor Center and museum before heading back down. The three-hour tour offers more time for hiking or exploration. Tours are generally available from 8:30 am until 5 pm with shorter hours in spring and fall and require reservations.